It was a good day for Cthulhu. ...I think I have a thing for balloons. I don't know why. 9 x 12, mixed media, prints for sale for $10 and $20 plus shipping, original SOLD. Send a note or visit [link] for details! He needs a bra. Funny, Lovecraft's characters never mentioned that. The stars were right again, and what an age-old cult had failed to do by design, a band of innocent sailors had done by accident. After vigintillions of years great Cthulhu was loose again and ravening for delight. He was, impossibly and to the great surprise of those self-same sailors, the cutest thing to ever walk the earth. Makes me feel bad about attacking his eyes, or his brain before. Cthulhu is a being of incomprehensible horror. Sometimes, this manifests as cuteness. We cannot grasp with our feeble minds but one thing about him. He hates it when his name is spelled wrong. 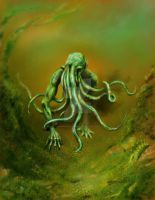 Cthulu is supposed to be a dark lord. Not some happy, "cute" thing. How dare you attempt to place restrictions on the great old one! If he desires to appear as cute he can! *give another scoop* just because you're are so cuthulhu!! NO! YOU'VE DOOMED US ALL! If he eats it, we will DIE! I CAN'T EVEN, whoa, whoa, too cute, too much cute, so much cute.. OMG!!!! SOOOO CUUUTE!!!! I'm just reading "The Call of Cthulhu" for the third time or sth and I absolutely adore You Cthulhu art! Anyone think that the balloon looks like him? I should have known this [link] was yours. I wanna hug him! DidIi just have tea with Cthulhu? Strangely enough, I got to Ursulav's Happy Cthulhu gallery from that exact page. Same here. I wouldn't mind being in a Ctulhu Cult if The Great Old Ones are this affable. I wonder if the little skull atop the ice cream is edible. For humans, I mean. Nothing is inedible for The Cuddly-Wuddly Great Old One! You're my favorite person ever! He's so happy! Loved 'digger by the way. Oh my gosh it's so cute.